Looking for a classy and affordable look? You have found it! Try an Equipment Welly white shirt paired with a Basicon yellow blazer and a See by Chloe wool blend black skirt and you have the start to a very fashionable outfit. 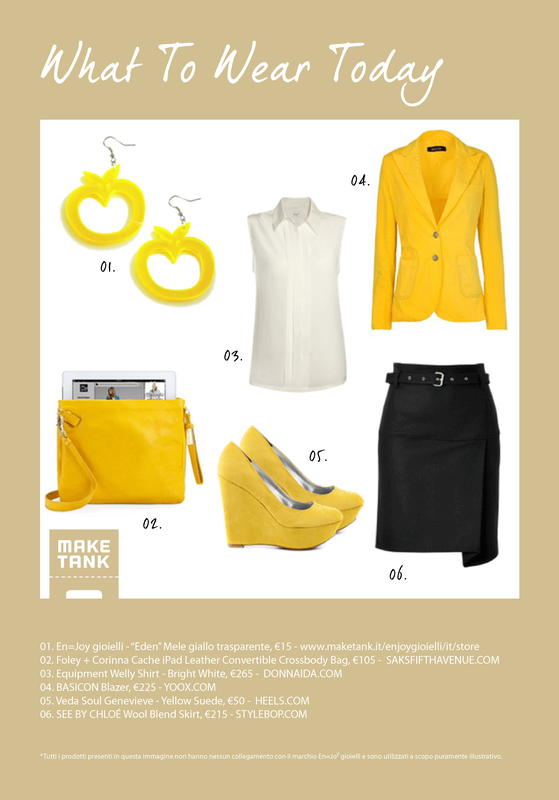 In order to keep the look going from head to toe add a yellow touch of light given by Veda Soul Genevieve heels and a pair of Apple earring made by En=Joy gioielli “eden” earrings (found them here for 15,00€). To top it off add a Foley and Corinna Cache cross-body bag and you are ready with a perfect style powered by En=joy! A Yellow Outfit Just For You!